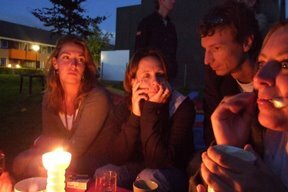 Last Saturday was the day: the First Novemberstraat Buurtbarbecue was held! With some 15 neighbours we had a good time at the field next to our block. The weather was perfect, and in the afternoon the kids kicked off with a bouncer castle and kids’ games. The party got off right with the firing of the barbecues. It was just a very nice party, with everybody enjoying themselves. The only pity was that co-organiser Peter fell ill and could not be there. It seemed that nobody wanted the party to end, so when the barbecues went out, the fire went on and we all shrugged together a bit more. It was just like in the old days: campfire, good storytelling, a whiskey and a cigar… Fun! See Renze’s pictures on Picasa for a full picture report.